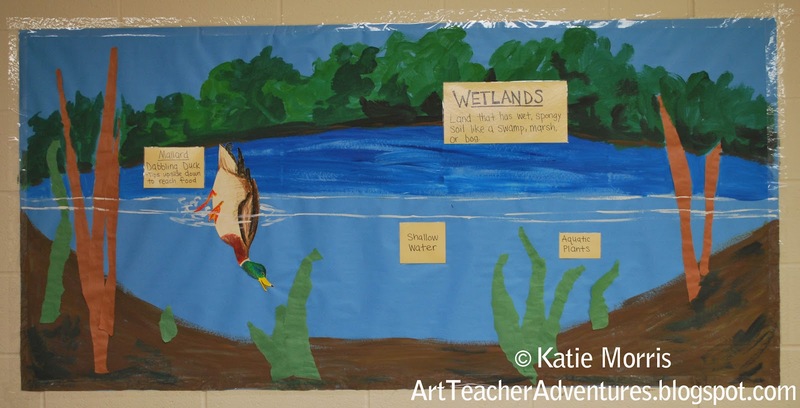 Even though there are 4 elementary Art teachers in my district (splitting 7 schools), we hardly ever teach the same lessons to our students. 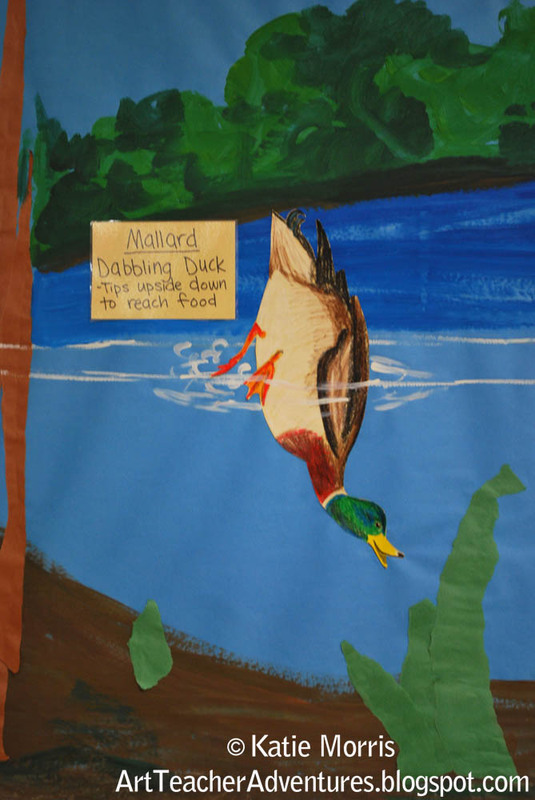 One project that the elementary students do across the district is the Jr. 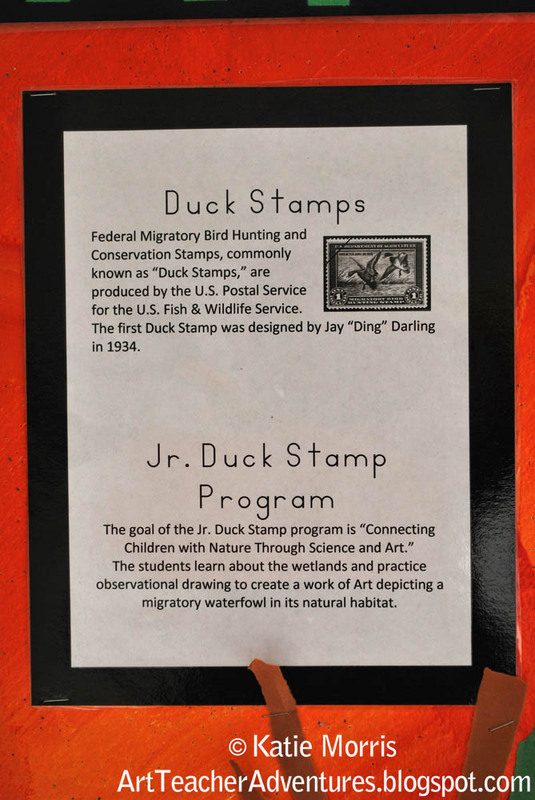 Duck Stamp program. This year I'm giving the students the choice of the Jr. 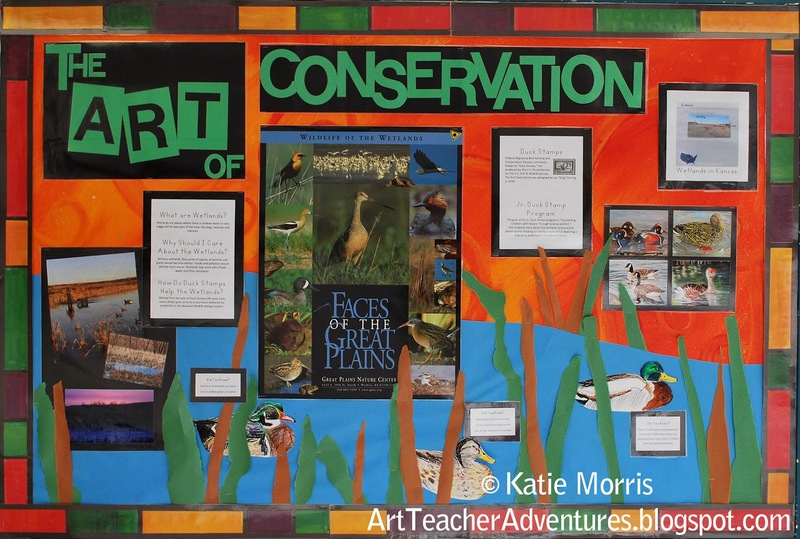 Duck Stamp program or the State Fish Art contest. 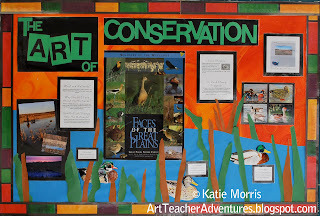 Both programs have similar aims of connecting kids to nature and teaching conservation through the Arts. 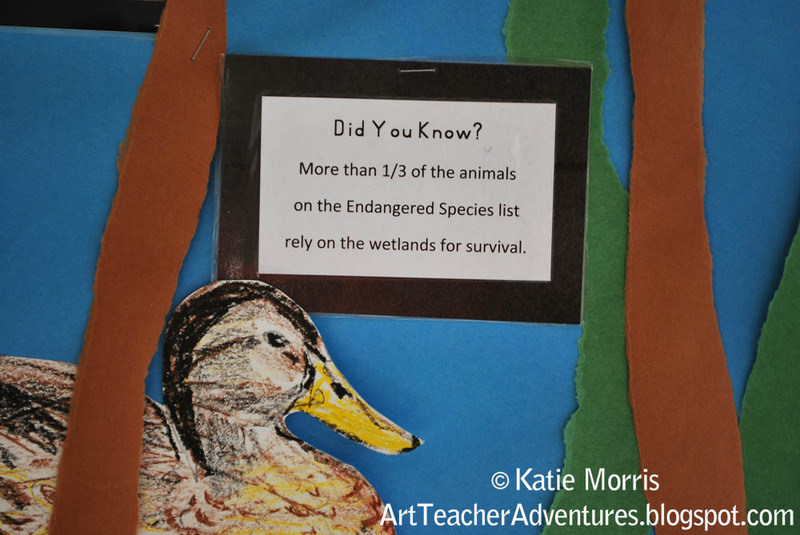 They are both integrate science- observational skills, anatomy, and learning about animals' natural habitats. 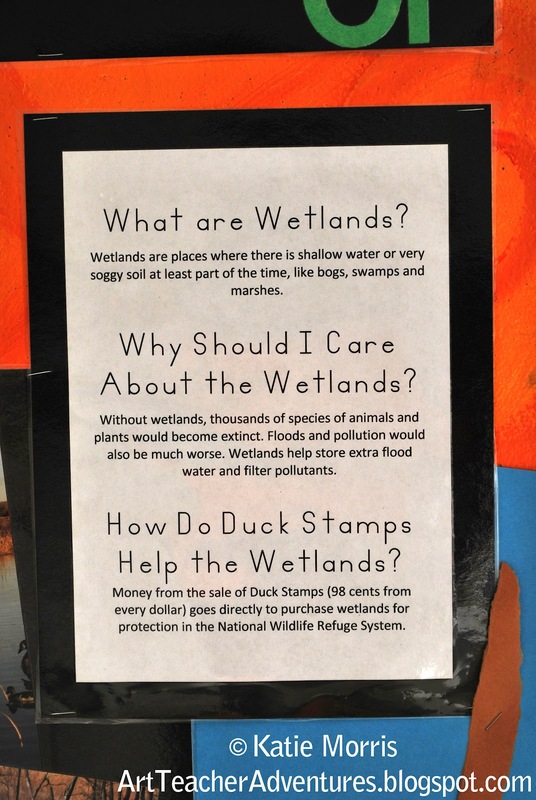 Duck stamps are about conserving the wetlands and the State Fish Art contest educates kids about fish and aquatic habitats. If you've been reading for a while, you know I love my bulletin boards. The visual of the Art hanging in the halls is usually how I share what we are doing but I don't hang ducks in the hallway- most are sent in to the contest (while some go home to be finished and disappear.) So, I compiled some information to remind students what the project is all about, and share it with parents and teachers. I have the background painted bright orange so I don't have to cover it with paper. I wanted to make it look a little swampy so I cut blue paper to go at the bottom for water and tore brown and green pieces to look like plants. I made my title with the die cut machine but decided to use different sizes and the negative space of the letters to add interest. I rarely plan out the arrangement ahead of time. I just get a feel for it and start stapling. 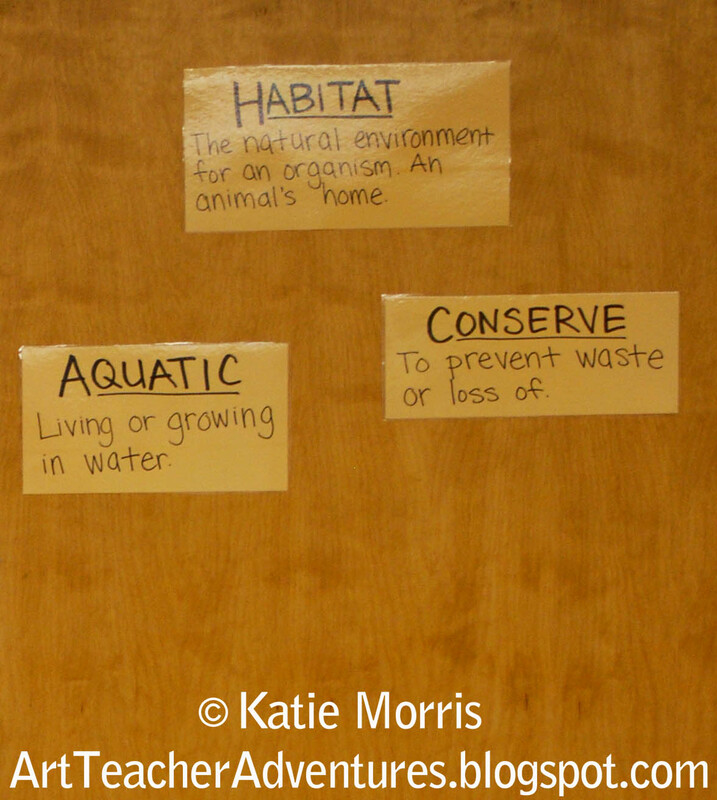 When I moved into my new 4th-6th grade classroom, I put up a word wall, convinced that it would just be a great idea. My best intentions failed since I rarely had time to make and put up new words. (I've seen some word walls with post-its for quick additions but they don't stick well to the paint.) I decided I was wasting space and should put up something else. 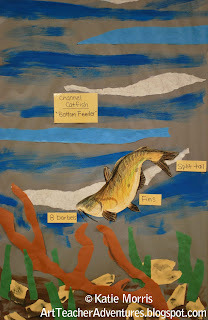 I whipped up some displays to illustrate the habitats we were talking about AND display the vocabulary. 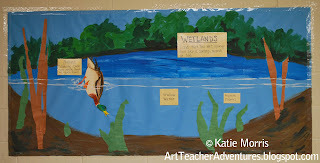 One display represents the wetlands- I painted it on butcher paper with some collage elements and labels and plastered the back with small loops of packing tape. I also sealed the edges with even more tape. 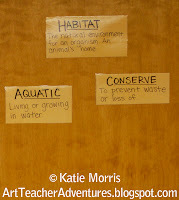 My aquatic habitat was made in a similar way only taped over a closet door instead of to the wall. I'm not committing to making such a big display for each new lesson, but I do plan to use the space to display materials relating to what is currently being studied. Maybe in coming years I'll be able to get a big bulletin board for that wall so I don't waste rolls upon rolls of tape. Most states have an official state fish, but Kansas doesn't for some reason. 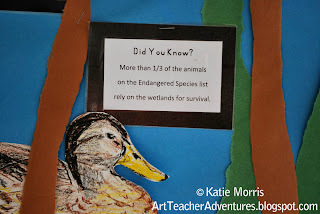 I'm not sure why since we have a bird, mammal, reptile, amphibian, and insect. Our unofficial state fish is the Channel Catfish. I've grown up fishing and feel like I know a fair amount about Kansas fish. I did learn quite a bit about channel cat while doing some research for this lesson. For example, their "whiskers" are really called barbels, and they have 8 of them! I also learned more about zebra mussels, an invasive species. I had heard people talk about them and seen educational flyers, but I didn't realize how much of an impact they are having. Next year, with more experience with this program, I'll be able to do a better job. 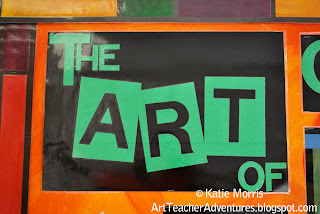 The 4th-6th grade students still have another week to work on their artwork during recess (lots have been taking me up on that offer) before it's due back to me. The 1st-3rd grade students are still working on them in class. I can't wait to share the finished artwork!